They are very knowledgeable and they are on demand for special projects. He had a lot of ideas and was extremely helpful. Well planned, they were very helpful. They were very knowledgeable and answered all of our questions. He is very reliable, he does quality work in planning, and he is very patient with the customers. He has very good dialogue and exchange of ideas and he listens well to the customers. I just like working with him. He has great ideas. He usually doesn't do my type of kitchen, but he made an exception and it ended up coming out great. 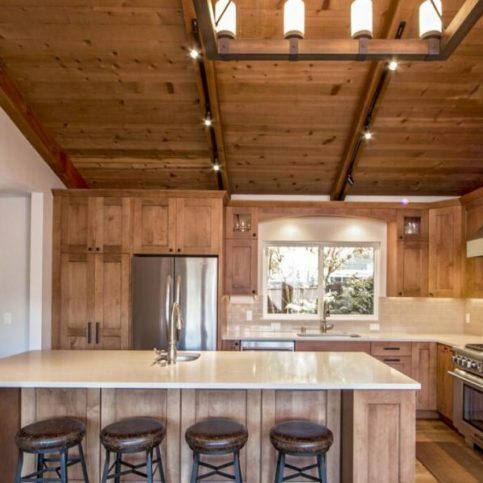 Kitchens by Ken Ryan, Inc. designs custom kitchens for residential clients throughout Marin and Sonoma Counties. With more than 30 years of experience in the kitchen industry, the company designs kitchens that range from traditional to contemporary and from moderate to extensive. It supplies a comprehensive design package for each project that includes everything from cabinet plans and CAD drawings to appliance specifications and lighting information. Owner Ken Ryan emphasizes the importance of communication throughout all phases of a renovation. During the kitchen design process, the company works closely with each client to make sure they’re getting everything they need and want, and that all options are explored. “I’m involved in all phases of the project, from the design, layout and permit plans to construction and completion,” says Mr. Ryan. Kitchens by Ken Ryan’s Novato showroom houses a large selection of the newest varieties of cabinet styles, flooring and countertop materials from several of the industry’s top manufacturers. The showroom enables homeowners to see exact samples of different door styles, wood species and colors, as well as all the upgrade options available for any particular design. “It’s a great resource for all types of kitchen projects,” says Mr. Ryan. 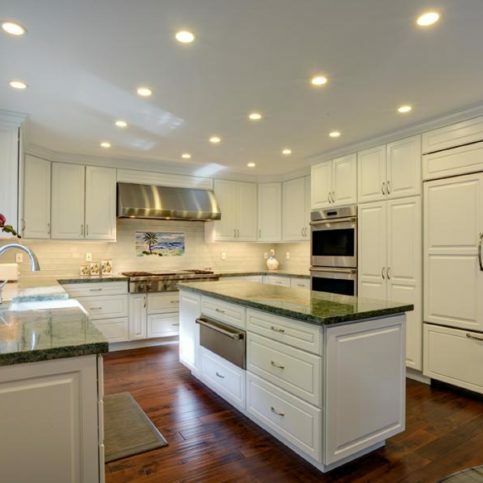 DIAMOND CERTIFIED RESEARCHED CAPABILITIES ON Kitchens by Ken Ryan, Inc.
Company Name: Kitchens by Ken Ryan, Inc.
DIAMOND CERTIFIED RESEARCHED ARTICLES ON Kitchens by Ken Ryan, Inc.
Kitchens by Ken Ryan, Inc. recently designed this kitchen remodeling project. Kitchens by Ken Ryan has been designing custom kitchens for residential clients in Marin and Sonoma Counties since 2008. 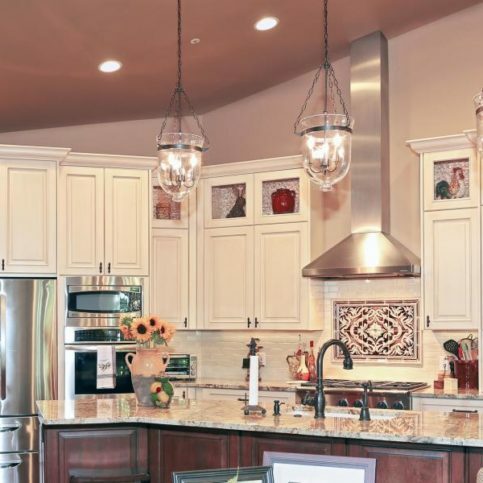 With more than 30 years of industry experience, Mr. Ryan is able to design kitchens that range from traditional to contemporary and from moderate to extensive. In addition to its design capabilities, the company’s Novato showroom houses a large selection of the newest varieties of cabinet styles, flooring and countertop materials from several of the industry’s top manufacturers. 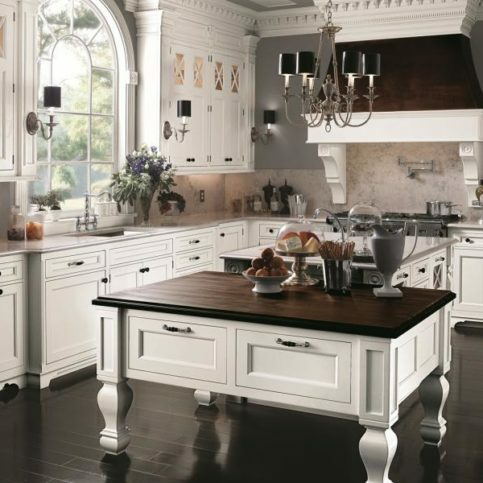 • Go with a simple kitchen design whenever possible. Employ single height wall cabinets, blind corner cabinets and other standard options. Watch your upgrades. • If possible, reuse existing appliances and build new cabinets around them. This could save you anywhere from $1,500 to $5,000. If you decide to purchase new appliances, choose energy-efficient models to reduce your utility bills. • The least expensive type of faucet is chrome—even a high-end model is considerably less than a mid-range brass or porcelain version. A standard two-handle faucet generally costs less than a single-handle faucet. Faucets and handles are sold separately, so you may want to choose a chrome faucet with brass or porcelain handles for a different look. • Choose neutral colors for fixtures, appliances and laminates—they’re less expensive initially and won’t look dated when color trends change. White and almond sinks are much cheaper than color varieties, and laminate colored countertops are cheaper than custom colors or textures. • If you currently have a vinyl floor covering and want to upgrade to a newer version, you can install synthetic floor leveler material over the existing vinyl floor and lay the new vinyl flooring on top (rather than tearing up the old flooring). • Your cabinet choices will drive the overall price of the design, so consider your options carefully. You can add options at a later date to defray some of the initial cost. Some easy ones include tilt front doors, spice racks and slide-out wire baskets. If you decide to wait, make sure the options you want will be available and can be added after installation. 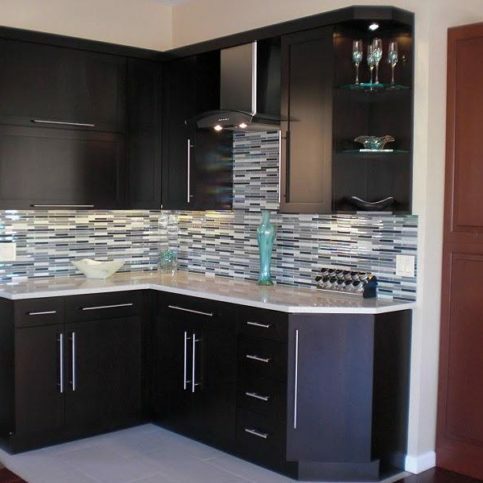 • Choose cabinets that can be operated without the addition of hardware. • Install cabinets without soffits to decrease labor costs. Also, consider cabinets without trim moldings or with simple trim. • If you’re going to install new wood trim to match new cabinets, order pre-finished trim instead of having the painting or staining done onsite. This will decrease labor costs. 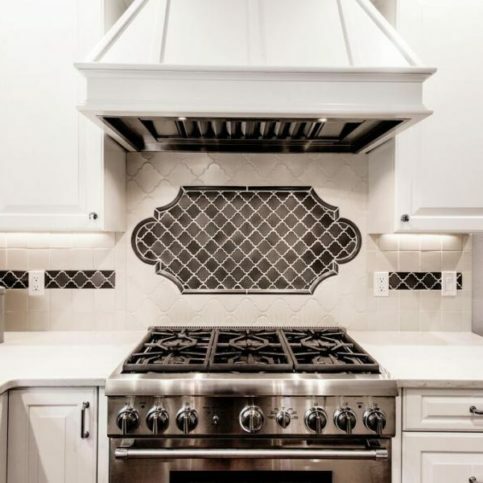 • Consider stenciling on the backsplash instead of using tile. Q: How long will my kitchen remodel take to complete? A: Typically, it takes about five weeks to complete the actual construction, which is when you’ll be unable to use the kitchen. If the job involves a lot of structural work or you’re expanding the kitchen into other areas of the house, it could take longer. Smaller jobs may be faster, but five weeks is a good planning figure until the design is finalized and we can say exactly what work will be required. Before construction, plan on four weeks for the design process and another four weeks for cabinet manufacturing and supply ordering. Q: Will my kitchen project have cost overruns? 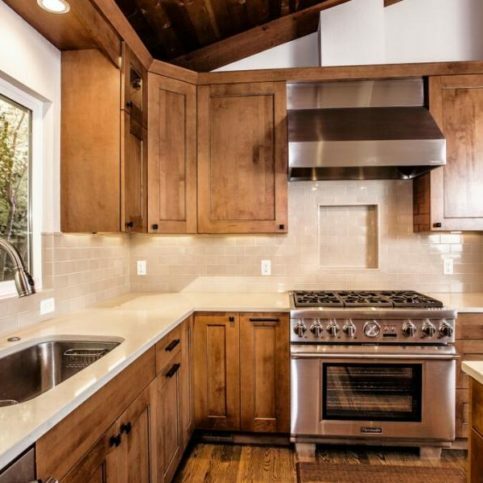 Q: Is a kitchen remodel a good investment? A: Realtors will tell you that by remodeling your kitchen, you’ll recoup 80 to 90 percent of the remodeling costs when you sell your home. If you plan on flipping the house and never living in it, a remodel probably isn’t a good investment, but if you think you may be selling the house in a few years, it’s usually a wise choice. 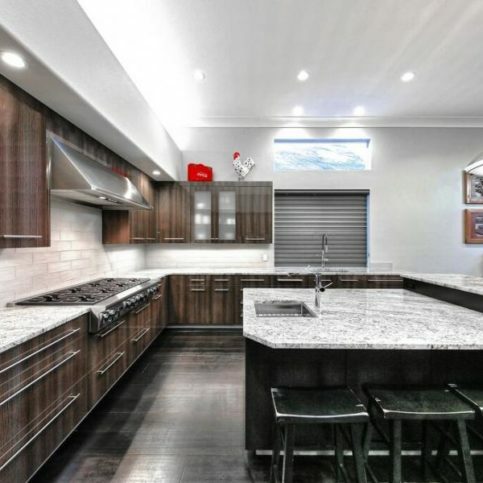 Q: What are the most expensive components in a kitchen remodel? 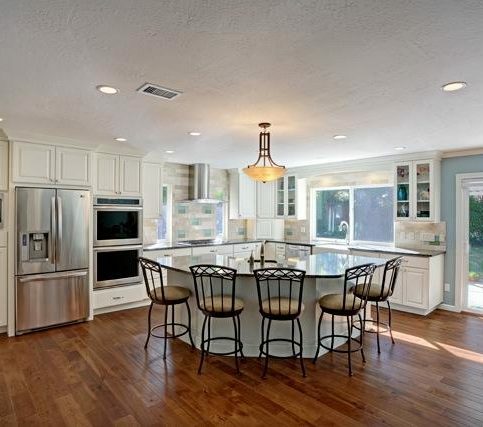 A: For mid-range remodels, cabinets and countertops are usually the most expensive elements. 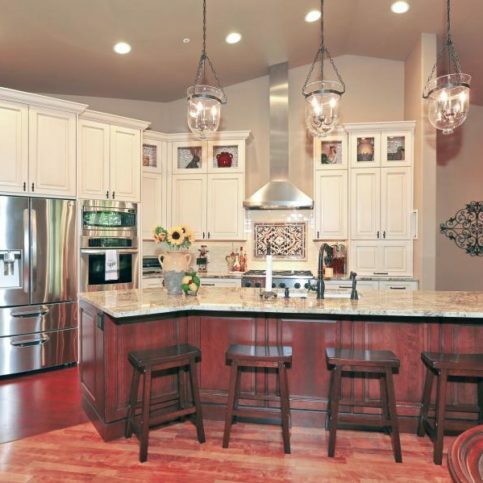 As you move into the high-end remodels, appliances become more expensive. Q: What do I do without a kitchen for five weeks? A: Good contractors will use plastic sheeting to minimize dust, so the rest of your house should be usable. You can usually move the refrigerator and set up a microwave in another room. Barbecuing is a good option, too. If you’re a food enthusiast, you’ll have to scale back and simplify your menus. It’s inconvenient for a few weeks, but the end result will be worth it. Q: Do you install cabinets as well as design and build them? A: No. 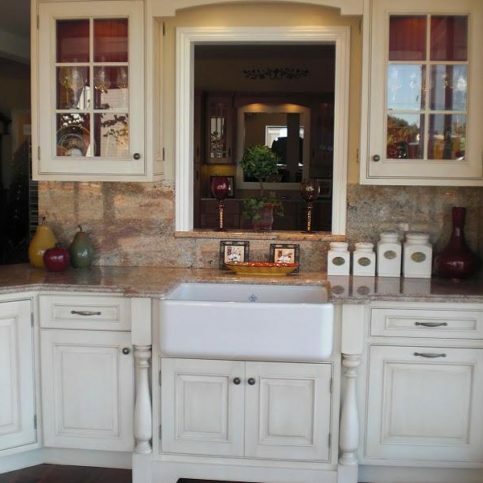 After we design and build your cabinets, we’ll work with a contractor of your choice to get them installed. SELECTED PHOTOS FROM Kitchens by Ken Ryan, Inc.
Kitchens by Ken Ryan installed this wine refrigerator and modern tile backsplash in a home in San Rafael. This display in Kitchens by Ken Ryan’s showroom features custom cherry cabinetry, a flat panel door and blue tile backsplash. This display in Kitchens by Ken Ryan’s Novato showroom features white cabinets with an espresso glaze and a farmhouse sink. 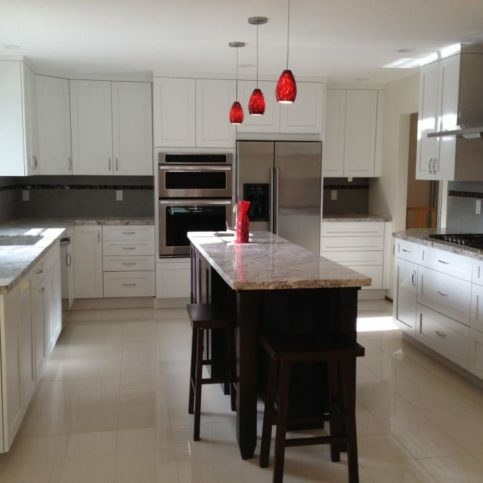 Kitchens by Ken Ryan installed these white cabinets with an espresso glaze. 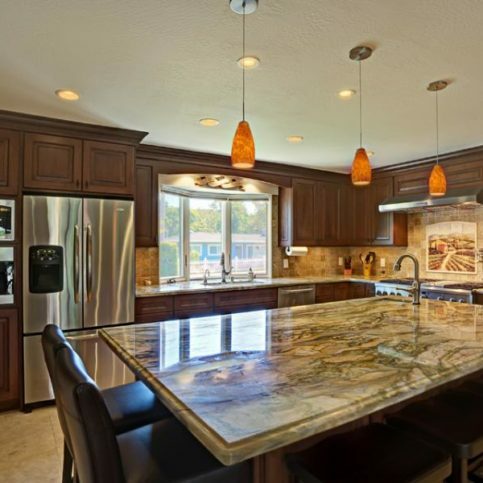 This kitchen project features Dura Supreme cabinets, a wood island and granite countertops. This kitchen project features Wood-Mode cabinets, multiple layers of crown molding, a dark walnut island top and recessed doors. 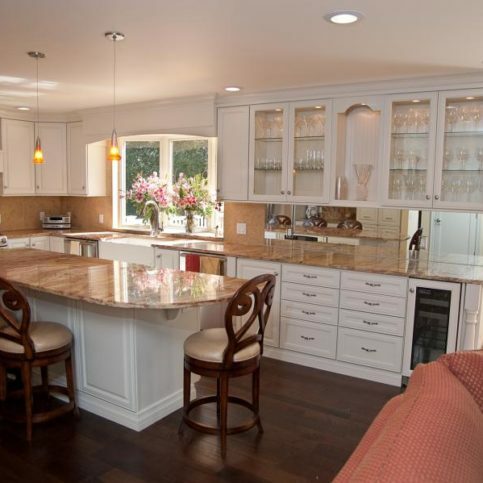 Kitchens by Ken Ryan installed white recessed cabinetry, glass display cabinets and a large island in this Napa kitchen. Ken Ryan is owner of Kitchens by Ken Ryan, a Diamond Certified company since 2011. He can be reached at (415) 935-0968 or by email. 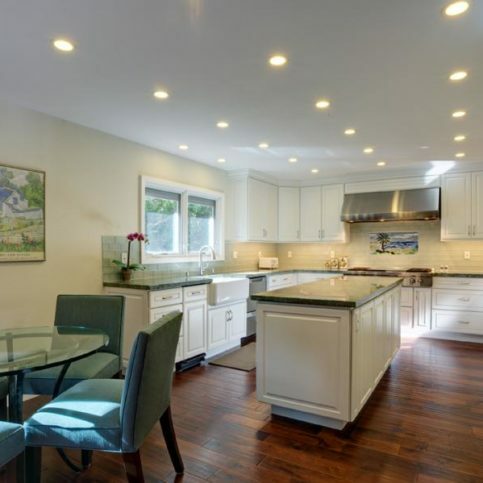 NOVATO – It wouldn’t be a stretch to say that Ken Ryan feels most at home when he’s in the kitchen—after all, with more than 35 years of experience as a kitchen designer and remodeler, he’s probably spent more time there than in any other household space. As Ken relates, his involvement with kitchen remodeling began early in life. “After attending trade school as a teenager on Long Island, I went to Los Angeles in 1978 to work for a kitchen remodeling company,” he remembers. “In 1982, they sent me up to the Bay Area to open a northern division of the company. 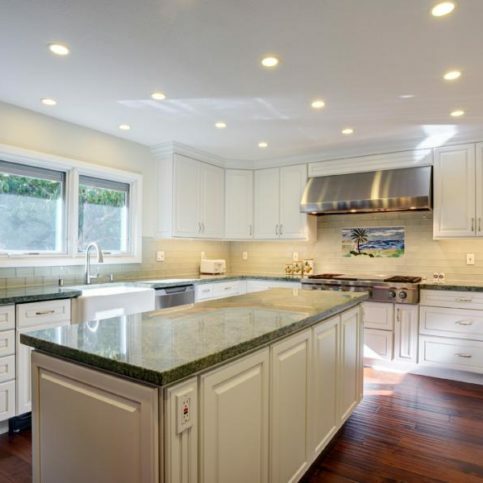 After working for that company for a few more years, I broke away and started my own business, and I’ve been remodeling kitchens in Marin ever since.” Today, clients of Kitchens by Ken Ryan continue to benefit from Ken’s extensive expertise. A: I have an atlas of the western United States that my family and I often refer to when planning our next adventure. We have discovered some truly beautiful places in our explorations. A: Tom Hanks—he can be very serious, but he can also be funny, and he strikes me as a very likeable person. A: Whenever I’m traveling or out on some excursion, I’ll pick up a rock. I use them as paperweights in my office or put them in my rock garden at home. A: Whitewater kayaking at Clavey Falls on the Tuolumne River. A: Advise on how to be humble and appreciate everything in life. 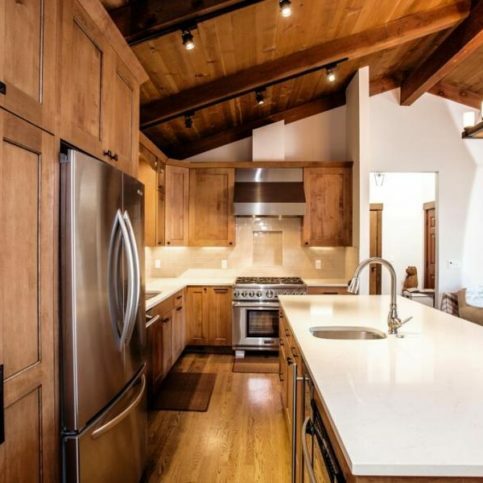 NOVATO — Host, Sarah Rutan: If you’re planning on remodeling your kitchen, you’ll first need to know where to start and what your options are. Today, we’re in Novato with Diamond Certified Expert Contributor Ken Ryan of Kitchens by Ken Ryan to learn more. Diamond Certified Expert Contributor, Ken Ryan: Many folks, when they’re remodeling a kitchen, have no idea as to – where to start. The best place to start is to call up a couple of kitchen dealers in your neighborhood. See what their process is, invite them out to your home so that way you can get a feel for who they are, their design style. And none of that should be at any cost to the homeowner. 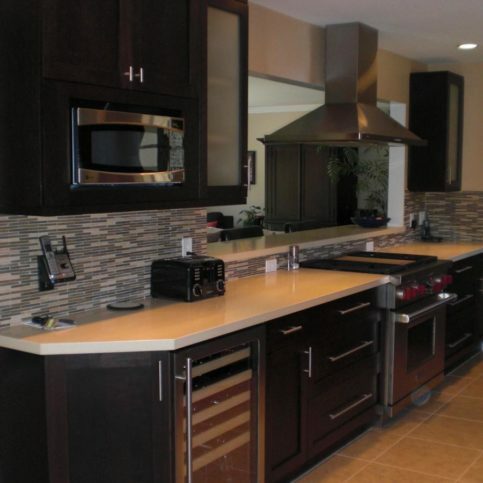 It should not cost you any money to find out what a kitchen remodel will cost. 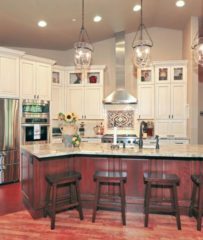 When it comes to cabinetry, there’s two types of cabinets: customer cabinetry that’s made local or modular cabinetry that’s made in large manufacturing facilities. The local cabinet manufacturer purchases doors from another facility, purchases drawer boxes from another facility, cuts and assembles cabinetry, and then sends it out for finishing to another facility. On the other hand, the modular companies do everything complete in one location. They dry their own lumber, they make their own cabinet doors, they make their own drawer boxes, they build everything complete, finish it complete, and send it out complete; therefore, they are actually more custom than the local manufacturer. When it comes to countertop material, there’s two types of countertop material that you would use: granite or marble or [quartz] products. 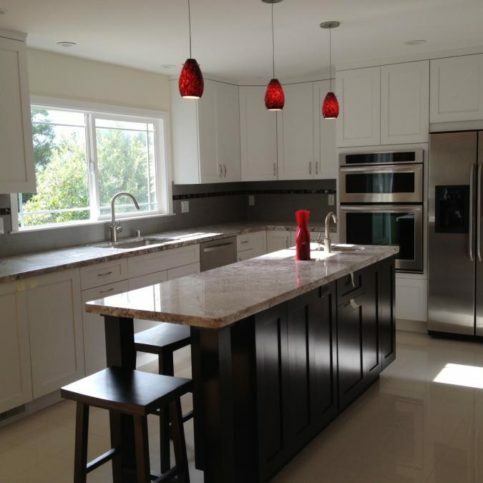 The [quartz] products are actually 97 percent ground up granite mixed with an epoxy. That epoxy eliminates the ability for it to stain so you never have to seal it. And it’s far more durable than natural stone, which has cracks and fissures in it. The granite has the beautiful work of Mother Nature, but you do have to seal it and take a little bit more care of it. Diamond Certified RATINGS ON Kitchens by Ken Ryan, Inc.
Kitchens by Ken Ryan, Inc. : Average 9.3 out of 10 based on 160 unique customer surveys of customer satisfaction. It's my second time, and I wouldn't shop anywhere else. I thought everything was pretty amazing, the cabinetry work and how everything just meshed. "10" out of "10" for design and quality, these guys are true craftsmen. I've recommended him to two other people already. I guess he has so much experience. He is able to look at a space and figure it out quickly. There is not a lot of piece smashing, I like to call it. He comes up with the right design and quickly. What I always tell people is, the first kitchen he did for us, he did so well. We never had to guess where things went. It was very obvious where things belonged. I would highly recommend them. We were very happy. Nothing really stands out in particular. They were very customer oriented and detail oriented. They quality of their work stands out. He is very personable, and he stands by his reputation. He went above and beyond. They were courteous, professional, and on the up-and-up. I really liked working with Ken and Mary. They explained every aspect to me. They were very thorough and very instructive. If you need help, he is the man to go to. He was very flexible, and the support staff was great. He brought new ideas to the table, and he listened to our ideas. I would highly recommend them. He keeps you posted on everything and he is always in contact with you. The fact that he lets you know what is going on, and he really will listen to you. He is so easy to work with and he thinks of details that I never knew existed. I would give them an â€œ11â€. He is thorough, efficient, and he knows his business. They provide dedicated, high-quality work. Not only is Ken a great designer, he is also a pretty good amateur psychologist. He did a good job of alleviating our fears about the project. 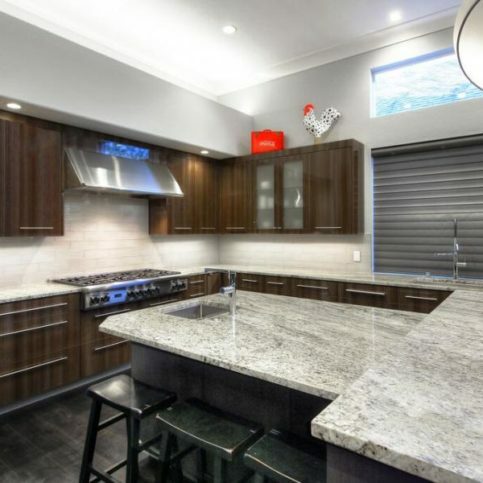 He also has a construction background so he understands a lot of minute details with regard to kitchen design. He knows how much difference an inch makes in practice, not just on paper. Ken is very attentive, he tells the truth and provides a good quality product. I liked that Ken was willing to advise me on the design of some other things in addition to my kitchen. Ken is very good. He has a very organized system and a network of contractors that he works with. We had several discussions regarding the planning of everything, and that level of organization was very important to this project. Ken really followed through and got us what we wanted. Ken is very professional. My wife loves to cook, so we called him up and Ken took it from there. He gave us advice based on the style and layout of the kitchen. I deal with a lot of different people every day and he is a top-notch guy. Ken's input and the quality of the kitchen, he supplies a great product. He's very exact, patient, organized, and personable. He gives you the exact prices, there are never any hidden fees, and he's a total perfectionist. I thought he was approachable, timely, and very helpful throughout the entire planning process. Ken is a good listener, he incorporates my ideas while also giving advice on how he thinks they would work best. Ken had a great working relationship with the contractor and was involved from the beginning to the end, so everything came out well. Ken pays really close attention to detail, he is very friendly and gave us lots of good suggestions. Because our kitchen area is very small, Ken suggested that we look at remnants of countertops instead of new pieces, and that really worked out. Ken is very helpful, and he works closely with other reputable people in the business so that everything goes very smoothly.